Among the many bad ideas in the latest healthcare cuts is one that would allow nurses to supervise labs and high complexity testing. I don't want to pretend that one profession is better than another, but I would not feel comfortable with a Lab Director supervising nurses, and I think it's reasonable to think the reverse is also inappropriate. What's stranger for me is that I have visited developing countries throughout the world where we (the US) are actively building the educational and legal infrastructure so that only specialized professionals can run laboratories. But now, in this unreasonable era, we're undoing that very practice right here at home. CMS is taking comments on this proposed change: so this isn't a fight that we've lost, it's a fight we can win. Here's what's new on Westgard Web this month, a special set of articles on hematology and QC. Does Hematology hearken back to substandard QC? Within the laboratory, biochemistry and hematology are often housed far apart from each other. But should their QC practices be distanced, too? Analyzing the hematology-specific results of our Global QC Survey, we find that while instrumentation has gotten more advanced, QC habits have not. There is a lot of room for improvement in the way hematology sections run controls. Hematology: How often are they "out"? When two generations of the same analyzer disagree, who do you say is wrong? 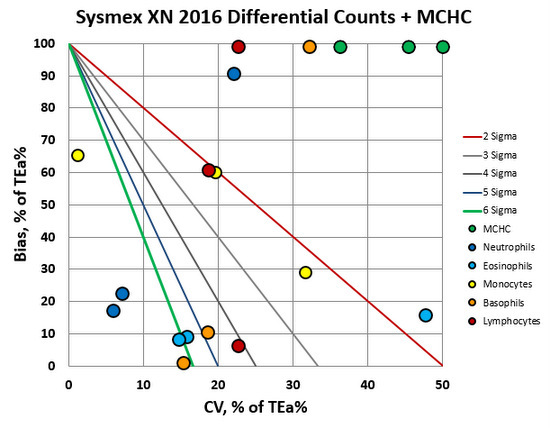 In 2016, we performed a Sigma-metric analysis of a 2016 paper on the performance of a Sysmex XN-2000. The authors contacted us this year to state they made mistakes in the original paper, and they have updated the analysis based on those corrections. CLIA, Rilibak, IQMH, RCPA 2010, "Ricos Goals" and Rilibak, and ESFEQA. They all specify targets for allowable analytical performance in hematology. How do these goals compare? Is there a consensus on the allowable total error for hematology parameters? Pop Quiz: How many equations are needed (at minimum) to calculate measurement uncertainty? In Biochemia Medica, a recent article detailed the Minimum requirements for the estimation of measurement uncertainty:Recommendations of the joint Working group for uncertainty of measurement of the CSMBLM and CCMB. Thank you KIMS and Kuwait! Thanks to Dr. Haya Altawalah - again - for inviting me back to Kuwait to deliver training to residents in clinical virology as well as a larger laboratory audience. Dr. Haya has been instrumental in bringing more Six Sigma thinking into the Gulf conferences on virology, serology, screening, etc. I held a small seminar just for the residents, where we not only talked about the evolution of QC but about various and sundry issues they were tackling in their laboratory. The second day was a larger workshop, more focused on chemistry and "traditional" testing, but with equally as engaged audience members. I was glad to have so many questions. Hope to return again soon! Thank you, Doha and Khalid Scientific! Thanks to Khalid Scientific, I was able to visit Doha, Qatar this month and over the course of two days, hold workshops for more than 250 lab professionals. I was especially honored to be able to present to Qatar's Medical Commission, responsible for all the visa screening. This vital job makes it all the more important that the tests are accurate on the very first result. Special thanks to Thomas Philip, who put these events together on short notice and took extremely good care of me while I was visiting. It was too short a visit, alas, and I look forward to returning again in the future. It was a great pleasure to attend the 2nd Conference on Lab Quality Management and Research Updates in Chemical Pathology in Alexandria, Egypt. Special thanks for Dr. Kamel the head of the Department and Dr. Rania El Sharkawy, who was meticulous in her arrangements of the events. Then we had the full conference, where we had many more attendees and topics to cover. Thanks again to Alexandria University's Biochemistry Department. Thanks also to all those who attended the conference. I hope to see you again in 2019!